Ah, thanks for mentioning this! I’ll add it. I did see that patch but didn’t connect the dots that it had the effect of fixing window rules for Electron apps, since that’s not mentioned anywhere in the Summary section. It does mention Spotify, but I don’t use Spotify and didn’t know that it was an Electron app. Is this all intentional, or do I miss something? What is the strategy here? Exactly. I should have made that clearer. Let me add a caption or something. We didn’t feel that the red color was effective here. The fact that it’s dangerous to fiddle with your OS isn’t very well connected to the places item being red; it wasn’t red anywhere else. Also, Dolphin doesn’t actually let you modify anything in there using the GUI. Well you can always change it back in new installs. Also, people’s existing installs will not be affected. I’m not sure if I misunderstood your issue but about the icons in Dolphin’s left panel, this article just exposes a new icon, with two different icon sizes. You can modify the size of the icons in the left panel by right-clicking on an empty space in this panel. Right click on the places panel, then click on the symbol size option: The icons of the screenshot to the left side correspondent to small and middle, while the icons of the screenshot to the right correspondent to the large and very large. So probably nothing has changed besides the new emblem. Right click on the places panel, then click on the symbol size option: The icons of the screenshot to the left side correspondent to small and middle, while the icons of the screenshot to the right correspondent to large and very large. Thanks for a great update, as every week. I do have one question though: Discover’s Settings page has been renamed “Sources”. Why? In every program it is called Settings and now in Discover it is called Sources. 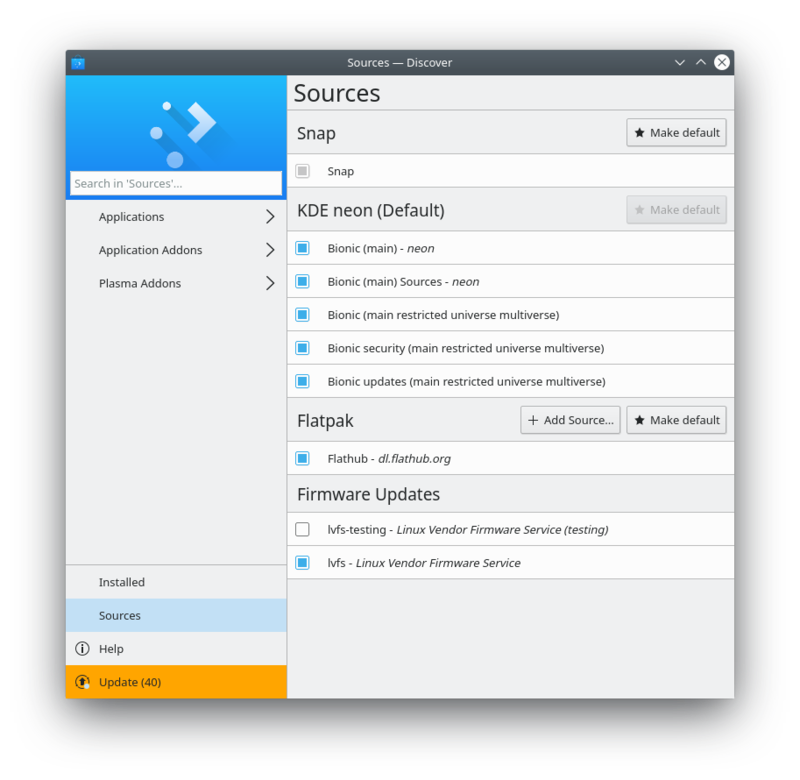 Isn’t KDE trying to get uniformity in all programs? I think this is a wrong decision which should be changed back. Just my opinion. On the whole “new icons root folder, root disk, and usage of those here and there” thing, I wonder… what happens to users of other iconsets? 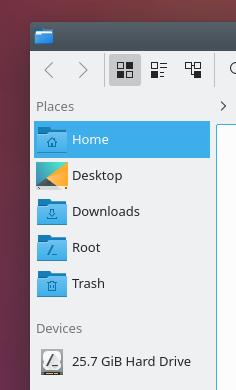 “folder-root” doesn’t seem to be listed in the standardized Icon Naming Spec, https://specifications.freedesktop.org/icon-naming-spec/icon-naming-spec-latest.html but then again, neither was “folder-red”. One could argue that this list seems to be heavily outdated, but shouldn’t DE developers aim to update the standardized list? Don’t worry, we took that into consideration. 🙂 KIconLoader has a neat trick: if an icon by the name of icon-something-foo doesn’t exist, it will fall back to icon-something if that exists. 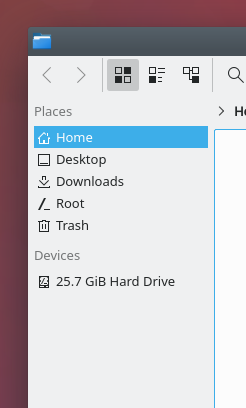 So for the root disk icon for example, when using an icon theme that doesn’t have the new icon, it will simply use the old icon (drive-harddisk. For the new folder icon, it will fall back to the standard folder icon. I don’t know why but the star icon in the “Make default” button from Discover’s sources page is bothering me. Maybe because it’s mainly used by GHNS? If anybody here wants to give it a try, we’d be much appreciated! Could be a good entry point for a new designer. Wouldn’t a check mark icon work for this case? I was thinking of this: The “Help” item on the sidebar could open a page, encompassing all things related instead of bringing a context menu. I can make a mockup if needed. Discover should be getting a real menu bar soon when used on the desktop, so once we have that, we’ll simply be able to give Discover the standard Help menu that all other KDE apps have. Would you consider adding categorical tabs or categorical icons (Application/File/Folder/etc) and vertical scrolling? – Filtering/categorizing tabs or icons would remove empty horizontal space. – Also frequently I find myself trying to find a document / e-mail / etc. but the number of available options is way too few, so I have to use a different tool, which IMO misses the point. Those are great ideas! They probably would not be too difficult to implement. Can you submit them individually using bugs.kde.org? Thanks! I don’t use Yakuake, so I wasn’t aware of this. I’ll see what I can do though! 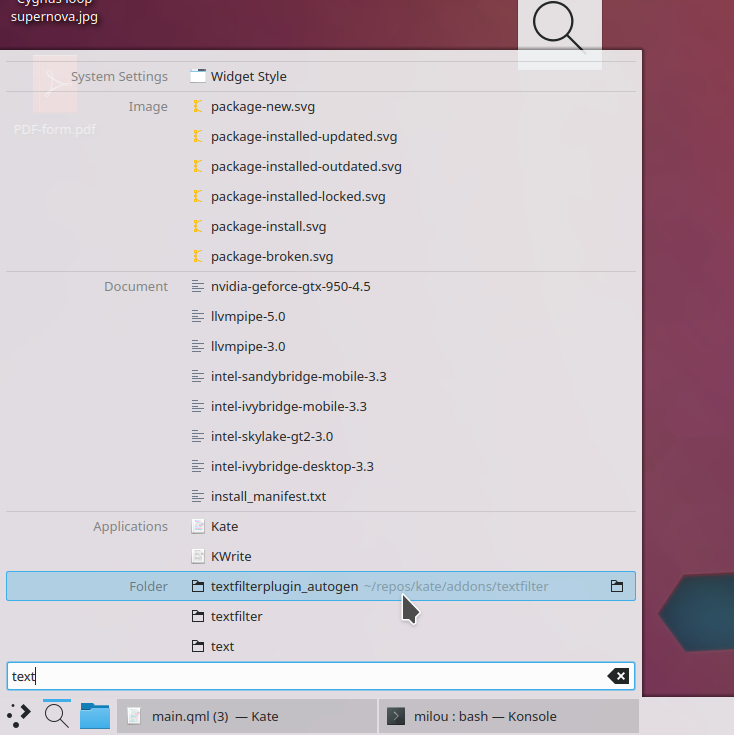 KDE Connect doesn’t work properly after mobile version updated. When someone calls it doesn’t stop video player anymore. Is it just me or should i report this as a bug? Kscreen apperantly got broken, again. When i close laptop screen the TV screen doesn’t become the main one i can only see the extended part. Also it changes resolution of main screen once plugged in every time, so i have to go to settings and changed but there lies another bug. If you set resolution is automaticly changes refresh rate to something like 40s and if you changes it resolution is changed again, so you need first to change fresh rate and THEN change resolution. Its crazy people. Apperantly however is responsible for this stuff has no laptop or dualscreen, so these things will appear from time to time again and again. You’ve got some funding recently, just the man a different screen to test with. Greetings and thanks for the work you do, I would suggest a change to the default theme that I find very nice breeze. However, in my opinion there is inconsistency from my point of view, I refer to the color of the title panel which in my opinion should be equal to the panel under white. What do you think about it ? Thanks for the reply, I have to admit that you have convinced me, after which the personal taste remains, but I realize that it is subjective.